Marie-Joseph Paul Lagarde [1851-1903], Paris. Capt. Edward H. Molyneux [1891-1974], Paris, by 1952; sold 15 August 1955 to Ailsa Mellon Bruce [1901-1969], New York; bequest 1970 to NGA. Husband of the sitter; not included in the sale of the Lagarde collection held at the Galerie Georges Petit 27 January 1897. 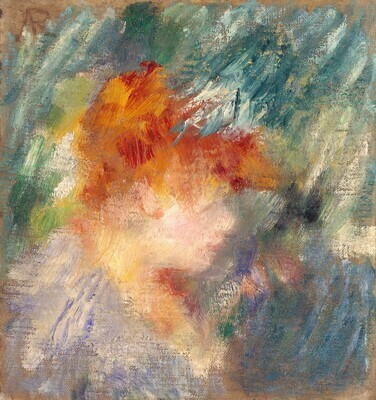 Exhibited as part of Molyneux collection in 1952 at the National Gallery of Art. Purchase date recorded in the Ailsa Mellon Bruce notebook now in NGA archives. French Paintings from the Molyneux Collection, National Gallery of Art, Washington, D.C.; Museum of Modern Art, New York, 1952, unnumbered checklist, as "Red Head" -- Portrait of Mlle. Samary. Paintings from the Collection of Mrs. Mellon Bruce, Society of the Four Arts, Palm Beach, 1958, no. 35, as "Red Head" - Portrait of Mlle. Samary. Small French Paintings from the Bequest of Ailsa Mellon Bruce. Exh. cat. National Gallery of Art, Washington, D.C., 1978: 72, repro. (continuing exhibition beginning in 1978). Vollard, Ambroise. Tableaux, Pastels & Dessins de Pierre-Auguste Renoir. Paris, 1918: no. 110. European Paintings: An Illustrated Catalogue. National Gallery of Art, Washington, 1985: 347, repro.